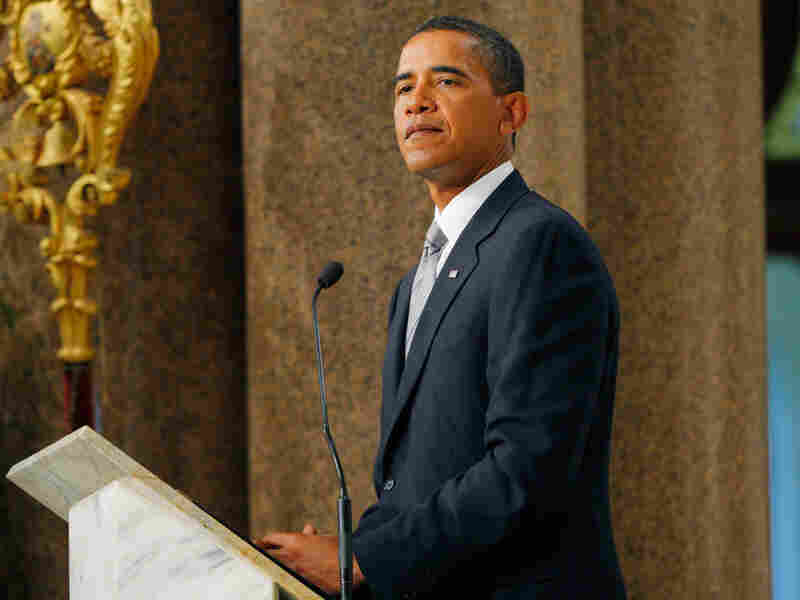 Text: President Obama's Eulogy For Sen. Kennedy President Obama delivered the eulogy for Sen. Edward Kennedy at Our Lady of Perpetual Help Basilica in Roxbury, Mass., Saturday. President Obama delivers the main eulogy during funeral services for Sen. Edward Kennedy in Boston on Saturday. Today we say goodbye to the youngest child of Rose and Joseph Kennedy. The world will long remember their son Edward as the heir to a weighty legacy; a champion for those who had none; the soul of the Democratic Party; and the lion of the United States Senate — a man who graces nearly 1,000 laws, and who penned more than 300 laws himself. Through his own suffering, Ted Kennedy became more alive to the plight and the suffering of others — the sick child who could not see a doctor; the young soldier denied her rights because of what she looks like or who she loves or where she comes from. The landmark laws that he championed — the Civil Rights Act, the Americans with Disabilities Act, immigration reform, children's health insurance, the Family and Medical Leave Act — all have a running thread. Ted Kennedy's life work was not to champion the causes of those with wealth or power or special connections. It was to give a voice to those who were not heard; to add a rung to the ladder of opportunity; to make real the dream of our founding. He was given the gift of time that his brothers were not, and he used that gift to touch as many lives and right as many wrongs as the years would allow. We can still hear his voice bellowing through the Senate chamber, face reddened, fist pounding the podium, a veritable force of nature, in support of health care or workers' rights or civil rights. And yet, as has been noted, while his causes became deeply personal, his disagreements never did. While he was seen by his fiercest critics as a partisan lightning rod, that's not the prism through which Ted Kennedy saw the world, nor was it the prism through which his colleagues saw Ted Kennedy. He was a product of an age when the joy and nobility of politics prevented differences of party and platform and philosophy from becoming barriers to cooperation and mutual respect — a time when adversaries still saw each other as patriots. And that's how Ted Kennedy became the greatest legislator of our time. He did it by hewing to principle, yes, but also by seeking compromise and common cause — not through deal-making and horse-trading alone, but through friendship, and kindness, and humor. There was the time he courted Orrin Hatch for support of the Children's Health Insurance Program by having his chief of staff serenade the senator with a song Orrin had written himself; the time he delivered shamrock cookies on a china plate to sweeten up a crusty Republican colleague; the famous story of how he won the support of a Texas committee chairman on an immigration bill. Teddy walked into a meeting with a plain manila envelope, and showed only the chairman that it was filled with the Texan's favorite cigars. When the negotiations were going well, he would inch the envelope closer to the chairman. When they weren't, he'd pull it back. Before long, the deal was done. It was only a few years ago, on St. Patrick's Day, when Teddy buttonholed me on the floor of the Senate for my support of a certain piece of legislation that was coming up for vote. I gave my pledge, but I expressed skepticism that it would pass. But when the roll call was over, the bill garnered the votes that it needed, and then some. I looked at Teddy with astonishment and asked how had he done it. He just patted me on the back and said, "Luck of the Irish." Of course, luck had little to do with Ted Kennedy's legislative success; he knew that. A few years ago, his father-in-law told him that he and Daniel Webster just might be the two greatest senators of all time. Without missing a beat, Teddy replied, "What did Webster do?" But though it is Teddy's historic body of achievements that we will remember, it is his giving heart that we will miss. It was the friend and the colleague who was always the first to pick up the phone and say, "I'm sorry for your loss," or "I hope you feel better," or "What can I do to help?" It was the boss so adored by his staff that over 500, spanning five decades, showed up for his 75th birthday party. It was the man who sent birthday wishes and thank-you notes and even his own paintings to so many who never imagined that a U.S. senator of such stature would take the time to think about somebody like them. I have one of those paintings in my private study off the Oval Office — a Cape Cod seascape that was a gift to a freshman legislator who had just arrived in Washington and happened to admire it when Ted Kennedy welcomed him into his office. That, by the way, is my second gift from Teddy and Vicki after our dog Bo. And it seems like everyone has one of those stories — the ones that often start with "You wouldn't believe who called me today." Not only did the Kennedy family make it because of Ted's love — he made it because of theirs, especially because the love and the life he found in Vicki. After so much loss and so much sorrow, it could not have been easy for Ted to risk his heart again. And that he did is a testament to how deeply he loved this remarkable woman from Louisiana. And she didn't just love him back. As Ted would often acknowledge, Vicki saved him. She gave him strength and purpose; joy and friendship; and stood by him always, especially in those last, hardest days. This is how Ted Kennedy lived. This is his legacy. He once said, as has already been mentioned, of his brother Bobby that he need not be idealized or enlarged in death because what he was in life — and I imagine he would say the same about himself. The greatest expectations were placed upon Ted Kennedy's shoulders because of who he was, but he surpassed them all because of who he became. We do not weep for him today because of the prestige attached to his name or his office. We weep because we loved this kind and tender hero who persevered through pain and tragedy — not for the sake of ambition or vanity; not for wealth or power; but only for the people and the country that he loved. Ted Kennedy has gone home now, guided by his faith and by the light of those that he has loved and lost. At last he is with them once more, leaving those of us who grieve his passing with the memories he gave, the good that he did, the dream he kept alive, and a single, enduring image — the image of a man on a boat, white mane tousled, smiling broadly as he sails into the wind, ready for whatever storms may come, carrying on toward some new and wondrous place just beyond the horizon. May God bless Ted Kennedy, and may he rest in eternal peace.